The seasonality of influenza activity contributes to seasonal patterns in morbidity and mortality, particularly among vulnerable populations such as patients with ESRD. 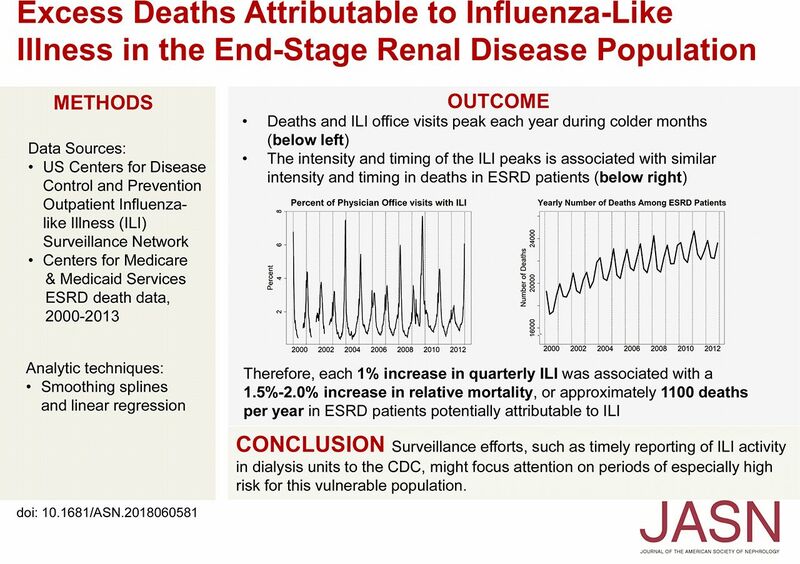 However, the relationship between seasonal fluctuations of influenza-like illness (ILI), which encompasses a wide range of respiratory infections, and seasonal patterns of mortality in patients with ESRD has not been explicitly examined. Using data from a Centers for Disease Control and Prevention (CDC) ILI surveillance network and the Medicare ESRD database, the authors found that community ILI activity is associated with seasonal variation in mortality among patients with ESRD, and likely contributes to >1000 deaths per year. Greater emphasis on surveillance efforts, such as timely reporting to the CDC of ILI activity within dialysis units, and study of treatment and containment strategies during high-risk periods, may be warranted. Background Morbidity and mortality vary seasonally. Timing and severity of influenza seasons contribute to those patterns, especially among vulnerable populations such as patients with ESRD. However, the extent to which influenza-like illness (ILI), a syndrome comprising a range of potentially serious respiratory tract infections, contributes to mortality in patients with ESRD has not been quantified. Methods We used data from the Centers for Disease Control and Prevention (CDC) Outpatient Influenza-like Illness Surveillance Network and Centers for Medicare and Medicaid Services ESRD death data from 2000 to 2013. After addressing the increasing trend in deaths due to the growing prevalent ESRD population, we calculated quarterly relative mortality compared with average third-quarter (summer) death counts. We used linear regression models to assess the relationship between ILI data and mortality, separately for quarters 4 and 1 for each influenza season, and model parameter estimates to predict seasonal mortality counts and calculate excess ILI-associated deaths. Results An estimated 1% absolute increase in quarterly ILI was associated with a 1.5% increase in relative mortality for quarter 4 and a 2.0% increase for quarter 1. The average number of annual deaths potentially attributable to ILI was substantial, about 1100 deaths per year. Conclusions We found an association between community ILI activity and seasonal variation in all-cause mortality in patients with ESRD, with ILI likely contributing to >1000 deaths annually. Surveillance efforts, such as timely reporting to the CDC of ILI activity within dialysis units during influenza season, may help focus attention on high-risk periods for this vulnerable population.